The Catholic Bishops Conference of Nigeria has rejected the proposed plan of the Federal Government to set up cattle colonies in the country. President of the conference Reverend Ignatius Kaigama said this on Thursday when he led a delegation of the religious body to visit President Muhammadu Buhari at the Presidential Villa in Abuja, the nation’s capital. On ways to end the clashes between farmers and herdsmen, he advised the government to seek other alternatives to open grazing rather than introducing cattle colonies. The Catholic bishops also informed the President about their worry over what they termed too much poverty, hunger, insecurity and violence in the country. They were concerned about what they call hopelessness in the land and condemned the activities of herdsmen across the country. The religious group described as shocking, the purported silence of government in the wake of the attacks that left many dead in Benue, Adamawa, Kaduna, and Taraba states. They, however, called on the government to invest more in arming the police with modern equipment to effectively fight crimes and criminality in the country. The clergymen decried the purported of lack of adherence to the principle of Federal Character in some government appointments. In his response, President Buhari explained that the policy proposed by Federal Government in response to the crisis was not meant to colonise any part of the country. He, however, said the intention of the government was to create grazing locations for cattle rearers, which has now been misconstrued as another form of colonisation. The President was concerned that the well-thought-out policy, which was conceived after wide consultations with stakeholders, had been largely misunderstood by a section of the public. 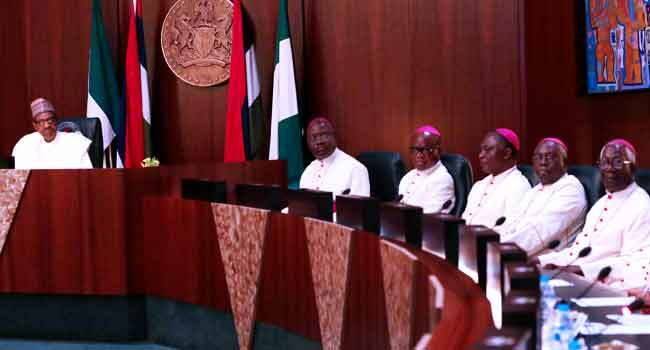 He assured the Catholic Bishops that the Federal Government would continue to explore all opportunities and support initiatives to ensure peace and stability in restive areas. On the appointments made so far, President Buhari told the delegation that no ethnic group or political zone has been deliberately marginalised. But he assured the clergymen that he would take a second look at areas on which issues have been raised when a compendium of all government appointments is submitted to him.